eco Internet Industry Association E.V., Europe's largest Association serving the interest of the Internet Industry with more than 1,000 members from more than 60 countries and the Internet Infrastructure Coalition (i2Coalition), a rapidly growing association with 100+ of the largest and most influential members in the Internet infrastructure industry, plan to intensify their longstanding co-operation. 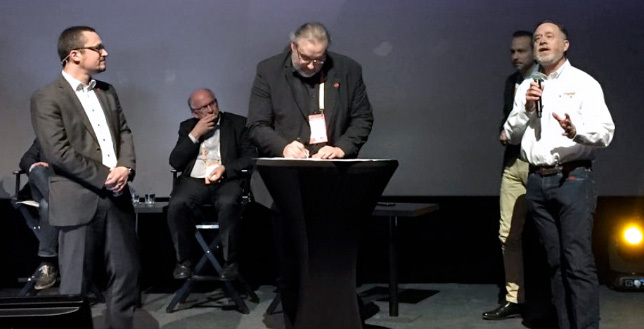 They chose to publicly sign a Memorandum of Understanding at World Hosting Days. The venue is no coincidence since the conference is the world's largest hosting event with more than 6,500 attendees. Klaus Landefeld, Member of the Board at eco Association commented: "We want it to be known to all those running the technical infrastructure of the Internet that they can rely on our organizations to take care of their interests when it comes to Internet Governance and regulatory matters on both sides of the Atlantic." David Snead, i2Coalition's Board Chair added: "There are many areas of joint interest where our collaboration will be to the benefit for all those we represent." The co-operation shall cover areas such as fighting abuse, policy making, and awareness raising. The organizations have been working together successfully already in the context of the IANA Stewardship Transition, The Messaging Malware and Mobile Anti-Abuse Working Group (M3AAWG), and the Internet Service and Providers and Connectivity Providers Constituency (ISPCP) at ICANN. Local Time: Wednesday, April 24, 2019 09:32 PM PDT – Page Load: 0.3366 Sec.